Possibly the most exciting aspect of the tarpon fishery in Belize is the large resident population of 60 to 100+ pound fish. Migrating fish may show anytime from March through August, but the resident fish are present year-round. The tarpon do move within relatively limited areas: sometimes on the flats, sometimes into the rivers, and other times in channels. Sometimes they are easy to find and, at other times, you can wonder whether they really exist. When weather conditions are right, finding them on the flats provides a sight fishing experience that can be electrifying. The second week of January, Brad Wolfe and three friends were aboard the Meca with Captain Martin McCord. The original plan for their week was to split their trip – first anchoring at Hicks Cay (pursuing tarpon, bonefish, snook, etc. in that area) and then spend the last two or three days in the permit rich waters south of Belize City. They never moved south. Instead, they had a very productive tarpon trip with fish to over 100 pounds. The weather provided four good days, one marginal day and one dismal day. Brad wrote an entertaining account of their trip with some meaningful insights on what tarpon fishing is all about. It’s a well known axiom, “If it can go wrong, it will.” We all know it as Murphy’s law. I secretly believe that Mr. Murphy must have arrived at his famous conclusion by having spent time chasing giant tarpon with a fly rod. It would not surprise me to learn that old Mr. Murphy was struck by his epiphany just after another silver king busted something. With these thoughts on our minds we touched down in Belize City, early winter, picture perfect weather. Everything was in place, proper fly reels with copious amounts of backing, tough 11 weight state of the art fly rods, perfect leaders, and fifty enticing tarpon offerings tied on razor sharp carbon steel. Our destination for the week was the mothership Meca captained by Martin McCord, without a doubt the best tarpon guide in Belize. The weather held for several days and we experienced fantastic action for tarpon and bonefish. 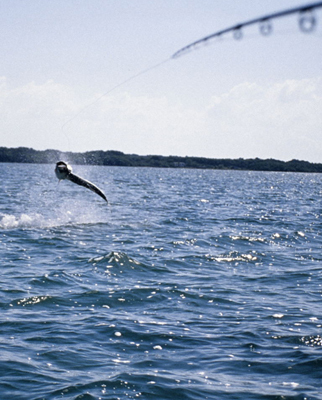 On one spectacular day we hooked twelve tarpon, all of which were over sixty pounds! During our “down time” for tarpon, we fished for bonefish. Belize is alive with large numbers of small to medium sized bones. Most of our fish were in the two to three pound range, great sport on a fast action light weight rod. We saw a few schools of permit, caught three nice sized cobia on the fly and had several shots at big snook. 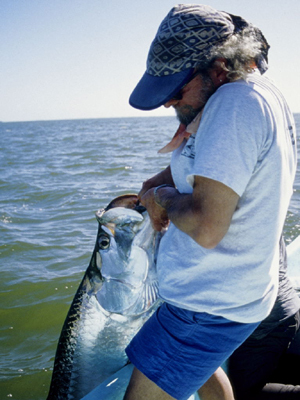 Use only the very best hooks: Tarpon have hard bone throughout their mouth. In order to get a shot at a solid hook-up I suggest that you only use Owner “Aki” hooks. These hooks are high carbon steel, large gauge, and razor sharp. They are quite expensive but worth the money when you consider your other costs. Tie your own leaders: Tarpon will put your terminal tackle to the true test of durability. Knot failure and broken leaders are very common when you tangle with the silver king. Do not trust some guy in a factory overseas to tie your knots. Since you are going to gear up for a tarpon quest, finish the job by learning to tie a proper tarpon leader. Your chances of landing a big fish will improve. Listen to your guide: They are not going to set you up with a “part time” inexperienced guide. Martin McCord has caught and released more tarpon in his sixteen years of guiding than 5 other guides combined. Go with the best guides and rely on what they suggest.